The Story of the "Hungarian Orange"
The "Hungarian Orange" in action. "Don't go. They will beat you. You can't achieve anything anyway." These were the comments of my mother, when I explained to her that I wanted to join the opposition protests in Budapest organized on the 23rd of October by the One Million for the Freedom of the Hungarian Press Movement (Milla). As a Hungarian living in Berlin I feel this resigned attitude is characteristic of a general atmosphere in Hungary. There is a general distrust towards politics, a burden from communist times, fuelled by more recent events. In 2006 a closed-door speech by Ferencs Gyurcsány, Prime Minister and head of the Hungarian Socialist Party (MSZP) at the time, revealed that they had falsified the country's economic data to win the elections. The reactions were riots and a majority vote for the conservative right-wing party Fidesz, which now governs the country. The results we have heard in the media: measures aimed at establishing indirect control over the media and the economy , centralizing power, reinforcing social hierarchies, and strong nationalist propaganda (directed notably against the EU) to divert attention from anti-democratic policies. Norbert Pálfi, one of the organisers of the Milla demonstration told me: "The two days in the year that people go on the streets are national holidays. The 23rd of October, the day the revolution of 1956 began and the 15th of March, commemorating the revolution of 1848. If you organise a protest on any other date, chances are that only a few people will show up." This 23rd of October was not only significant because of this, but because the government and the fragmented opposition were engaged in a “war of numbers”  aimed at showing who could mobilize a larger crowd and because Milla had announced that it would invite the country’s previous Prime Minister, Gordon Bajnai to come on stage. The far right party Jobbik also organized a demonstration in central Budapest, but this did not draw nearly as much attention as the other two. The commemoration of the Greens (Lehet Más a Politika) – held in the cemetary where the revolution’s martyrs were buried – went largely unnoticed. I travelled from Berlin to Budapest to lead a workshop introducing activists into the art of inflatables designed to support protests. The idea of inflatables emerged from an art-activist group I co-founded called the "eclectic electric collective." With the group we explore different forms of art-activism and are currently experimenting with the use of inflatables as an empowering tool for protests. We see inflatables as an element of playfulness and interactivity that can attract media attention, providing messages of dissent and collective creativity greater visibility. "A bit more yellow, a bit more savoury"
It was in the workshop that the idea of the "Hungarian Orange" came up. The term refers to an attempt in communist times to cultivate oranges in Hungary. As the climate is not suitable for subtropical fruits the mission failed. Importantly, the attempt was parodied in Péter Bacsó’s famous movie: “The Witness” (1969). In one of the scenes we see a party leader visit the co-operative where scientists experiment with orange-growing and learn that the comrade would like to taste an orange. As the only ripe orange is accidentally eaten, he is given a lemon instead, accompanied by the following explanation: "Its' the new Hungarian orange, a bit more yellow, a bit more savoury, but it's ours." It is thanks to Bacsó’s movie that the “Hungarian orange” became a symbol for expressing the gap between the sweet party propaganda and the daily sour reality of socialist life. The symbol was recycled by then liberal-alternative Fidesz in the early 90s. The party’s weekly paper was baptised “Hungarian orange” (Magyar Narancs ) and Fidesz adopted an orange circle as its logo. We decided that it was time to revive the "Hungarian Orange" as a visual meme. With the help of around 15 artists and activists we created a 5 meter long, 3.5 meter high inflatable lemon, which we brought to Kossuth Square where the “Peace march” organized in support of Fidesz ended and where Viktor Orbán gave his speech. Our idea was that when the TV cameras film the crowd (to show how gigantic the support for the government is and how little the support for the opposition) the giant inflatable lemon would also make an appearance. Unfortunately, this plan did not work. Having entered the crowd 500 meters before the square, the “peace-marchers”, who consisted mainly of retired people, asked us what this object was about. "It’s a Hungarian orange" – we said. It took them about a minute to digest the meaning of our inflatable at the end of which an older man shouted that we are from the oppositional newspaper “Hungarian Orange”. A chain reaction followed: "Go to Milla", one screamed. "Go to Gyurcsány-father ", another screamed. "Takarodjatok! "(get lost) they yelled in unison. Some older men tore the inflatable, ripped off the valves and tried to peek through the foil. 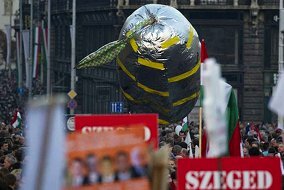 We knew that the Fidesz-supporters would not like our inflatable lemon, but the intensity of the reactions surprised us. Experiencing the 23rd of October in Budapest showed me how emotionally polarised and divided Hungary is at the moment. On the one side you have Fidesz supporters, many of whom were brought in by busses from all over the country. Their number was placed between 400.000 and 150.000. Viktor Orbán's central message to the crowd is that they won't let Hungary be governed by foreigners and that there is just one way forward. Then you have Jobbik and its supporters who are relatively few in Budapest, but well visible outside the capital city as they had a parallel rally in Gyöngyöspata. The far right party’s strategy is largely aimed at overtaking Fidesz from the right. That’s why you could hear its leaders reeling against the government claiming that Orbán is only feigning to act against foreign interests and its followers shouting "Orbán is a Gypsy!" during their march. When you plan the future you simply cannot forego thinking about the past, especially in this country. This is why far from everyone who opposes the current government was happy with Milla’s decision to invite Bajnai on stage, let alone joining forces with him. Although the former Prime Minister is not a member of the Socialist Party he does not rule out working together with the party. The problem for Milla is that by joining this new alliance so hastily it severely undermined its former strategy, which was aimed at building a new political culture in Hungary – one built on the principles of truth and justice, as well as the methods of critical engagment with the past and citizens’ participation. If Milla and "Together 2014" want to succeed, they will need to demonstrate in very practical terms their commitment to these principles and methods. If they don’t accomplish this, nothing will distinguish them from the parties of the past. See for more on the "war of numbers"
Video: The Story of the "Hungarian Orange"